I can’t claim to be doing all of this perfectly quite yet. But that’s really all the more reason to write to you about it. Elsewhere in the Primal Blueprint books and materials, there’s encouragement for us (or me, anyway!) to start slowly and work up to the level in Law #3. 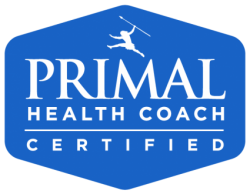 The main thing to avoid, in the Primal Blueprint lifestyle, is something that Mark Sisson calls “chronic cardio.” That is defined as slugging along on a run for an hour every day at a heart rate higher than low impact (55-75% of your maximum) but not high enough to be an all out sprint (full out for 10-15 seconds, with repeats when you’re ready, once every 7-10 days). The design of the program is meant to approximate what our primal ancestors did. They didn’t have desk jobs – they moved around slowly all day long. They gathered berries and tubers, they walked to the next camp occasionally, and do on. The only time they ran was to hunt for food or avoid being prey for another animal. That’s the purpose of the all out sprint every 7-10 days. Between sprints, they moved slowly to conserve energy for the next sprint. Primal men and women would have considered running away from nothing for an hour every day as an insane waste of energy. If you are like me and these ideas are new to you, and/or you’ve been meaning to get into better shape, you’re in luck. You can start slowly and work your way up to a fitter body no matter what your age or current condition. A more complete set of directions can be found here. You will have to subscribe to Mark’s blog, but I recommend that anyway.